Sunlight is essential to any Colorado home. The beautiful sun is one of the reason we live in Colorado. For its warmth, its charm, its cheerfulness, it is an extremely important decorating element. And one you should not sacrifice simply because you need privacy and light control. Silhouette Window Shadings by Hunter Douglas offer the perfect solution for your Colorado home. Two sheer fabric facings with fabric vanes suspended between them. When the vanes are open, the view outside is preserved, and your Colorado home’s natural light is gently filtered. 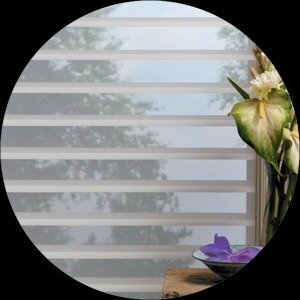 Closed, the fabric vanes allow you privacy while maintaining the soft, elegant style Silhouette Window Shadings create. When fully raised, Silhouette Window Shadings completely disappear into the head rail for an unobstructed view. 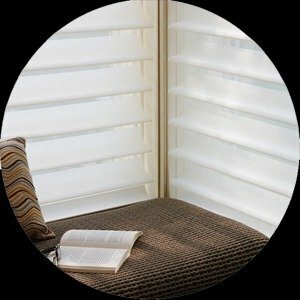 Your New View Blinds & Shutters window covering consultant will help you choose from a variety of fabrics, colors, and 2″, 3″, 4” vane sizes. The Signature S-Vanes are designed to put you in control of the amount of natural light that comes in, with beautiful effects. Transform the harsh Colorado exterior light by diffusing it, spreading it evenly throughout your room, so you can maximize daylight hours and reduce your need for artificial light. Our beautiful sheer fabrics also softly filter out brightness, glare, and UV rays, protecting your furniture and flooring from fading. With no cords or tapes, the sheer facings allow you to view through the vanes to the Colorado scenery, while maintaining a discreet level of privacy. For the most impactful view, choose our Quartette™ 4″ vane size. Controlling your window treatments with a mobile device or a remote means you can set your blinds to movie mode, work mode, or 6 a.m. mode with the touch of a button, without leaving your seat. It’s effortless, fun and smart, with perfectly smooth operation. Silhouette Duolite® is two shades in one, providing all the benefits of a traditional Silhouette shading but with an integrated room-darkening roller shade behind it. Position the room darkeningroller shade at any height for increased light control and privacy. This is a great option for bedrooms or media rooms. Silhouette Window Shadings can do it all! Silhouette Window Shadings feature beauty and elegance by creating a unique visual experience. 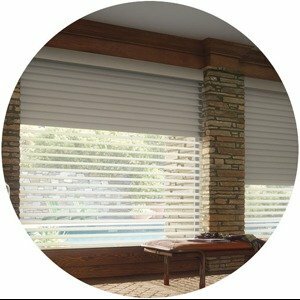 Combining the advantages of draperies, roller shades and blinds these shades offer light control, an unobstructed view of the outside, UV protection, privacy, energy efficiency, separate room-darkening option, manual or power controls and specialty shape applications. Silhouette Window Shadings do all this while providing a backdrop of understated luxury. There’s even a coordinated vertical product that’s perfect for your sliding glass doors, Luminette® Privacy Sheers. We will be happy to visit your home in Colorado at your convenience to assist you in making the right decision for your new Silhouette Window Shadings!